Where Bob Dylan Was While Keeping Silent About His Nobel Prize : The Record Dylan received criticism last fall after greeting the announcement of his Nobel Prize for Literature with silence. It turns out he was just busy revisiting his artistic development. 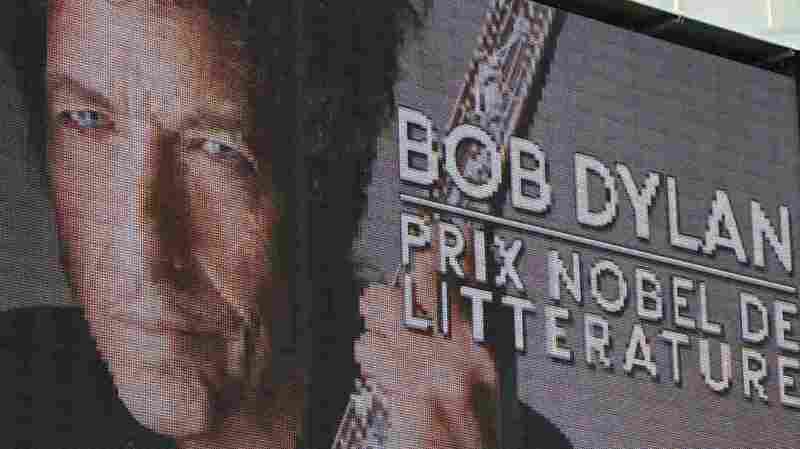 Bob Dylan, who announced he would accept in person the Nobel Prize for Literature, was silent after it was announced he would receive the prize. Amidst the criticism and his speechlessness, Dylan had been revisiting his own development. Nobody seemed to notice at the time, though proof of it has been out in plain view since late autumn. About a week-and-a-half after the Nobel announcement, during a tour stop in Tulsa, Okla. — where his own archives will live — Dylan paid a visit to the archives of Woody Guthrie, the artist who had as profound an influence on his artistic development as anyone. Dylan's spokesperson and the director of the Woody Guthrie Center both confirmed his appearance to NPR. There is — as Dylan prepares to accept his award during a tour stop in Stockholm — a poetic something to the thought of him walking amongst the exhibits, recalling the childhood bedroom (in Hibbing, amid the taconite) where he listened to the polemic young Guthrie, far from speechless, sing songs of liberation. This article originally stated Bob Dylan was on tour in Tulsa the day after the Nobel Prize announcement — it was 10 days after. As well, it stated that Dylan "sent" Patti Smith to accept his prize. In fact, Smith was asked prior to the public announcement of Dylan as its recipient.